Survival clothing - clothing that performs well in the wilderness in all weather conditions - is one of the most vital pieces of life-saving outdoor gear. Here we will cover principles of effective clothing as well as specific types to consider for outdoor use. Consider these important concepts along with your personal preferences to choose the best option for your situation. What makes clothing effective is their ability to shield us directly from the elements and insulate us by trapping our body heat. There are countless variations on the theme, and many brands claim to be the best or most effective, but clearly not all of them pass the test in the field. 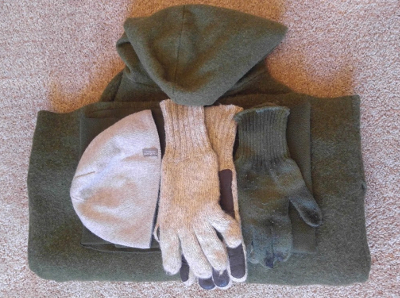 For starters, when considering effective survival clothing, you must break down what parts of the body you need to cover and what conditions you will be dealing with. Here are the major areas of the body to consider: your core, hands, feet, legs, head, and neck. Each of these areas need to be considered both together and separately. Next, consider what kind of environment you will be dealing with. Context is a large part of what will work, because wearing a thin silk shirt in the arctic winter would be as ineffective as wearing thick wool in the searing desert summer. It is useful to break up the clothing into specific layers. Base layers are those worn directly next to your skin. Outer layers are generally those which are exposed to the elements. Mid-layers are those which are worn in between base and outer layers. Layering is a very effective and intelligent way to deal with cold and with climates where temperatures can fluctuate rapidly in the course of a single day and night. The kinds of materials in the clothing will determine how they work and what they are made for. There is a popular saying, "cotton kills." This means that once cotton clothing gets wet from rain or intense sweating, it loses its insulating value. This is great for warm or hot weather, where such quickly breathable clothing allows sweat to evaporate and cool your body. This is terrible, however, under conditions where you are depending on those same cotton clothes to keep you warm, say during a cold autumn downpour or a sudden blizzard! Natural animal fibers, especially wool, are arguably one of the best all around materials in helping insulate our bodies in the cooler climates. Therefore wool clothing can be a significant part of your wardrobe for serious outdoor use. Silk is a surprisingly effective and resilient natural fiber, and because it is very comfortable it is a great choice as a base layer for survival clothing. 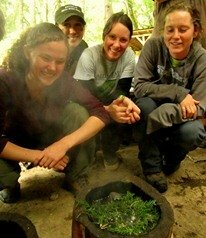 Earn Certificates in Survival Education and More. Get Information About Our Certification Program. Poly-fibers, such as Gore-Tex and related materials can be effective when used correctly. These are best as rain and wind-proof shells, worn as the most outer layer. These shells can be used with fewer under-layers during warmer times of the year merely as a way to reduce wind exposure. The challenges with using these fibers are that they often don't breath adequately and may encourage more profuse sweating. If they are vented properly by unbuttoning or unzipping, they can be incredibly useful. I personally keep a bag full of survival clothing in the trunk of my car, so that in case of stranding or an accident I can be prepared. 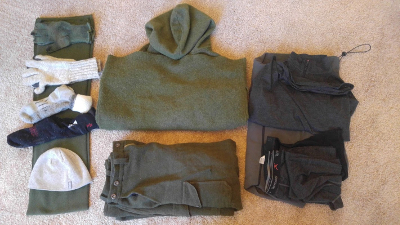 Since I live in the temperate Pacific Northwest, my clothing choices reflect dealing with cold and wet weather situations. - Thick plastic rain poncho (for dealing with the serious downpours). This can be made into an emergency shelter if the need arises. What I do not include in this bag, but have both on my body and in my trunk is a good pair of shoes that fit me well and are waterproof. Wetness is a part of life here in the Cascades of the Pacific Northwest, so keeping your feet dry is a must. It wouldn't hurt to have an additional pair to switch into when your first pair gets soaked or damaged. In understanding how insulation works to trap air, you can also use natural materials (such as dry dead leaves) stuffed in between your layers to help give you added insulation if you need more. You can also purchase or make alterations to an existing jacket that will hold such materials. These liner spaces can be filled with anything from cattail down, newspaper, feathers, dry moss or dry leaves. If you are desperate, even wet leaves can give you some insulation as long as that wetness does not seep down to your skin and make you wet. You can stuff your pants in a very similar way for extra warmth. Remember that the keys to effective survival clothing are insulation, proper use and ingenuity! Be creative and experiment with ways to make your gear match your needs. Test your gear in different environments and under different weather conditions. Learn more about survival clothing on the Wildwood Survival site. About the Author: Filip Tkaczyk is a periodic guest teacher at Alderleaf. He also wrote the field guide Tracks & Sign of Reptiles & Amphibians. Learn more about Filip Tkaczyk.